It feels good when all the maintenance on the motorcycles is up to date. I just completed a round of maintenance on the KLR650 and the ST1100. Here is what I did. We should be ready for our excursion to James Bay in Northern Quebec in a week. It was the middle of May, 2010, and I managed to get away for the first long ride of 2010. It was mostly cold and rainy on my way from London, Ontario, to Moncton, New Brunswick. In fact, it was cold most of the time I was there, and rainy. I did experience a few nice days in my week and a half in the Maritimes. 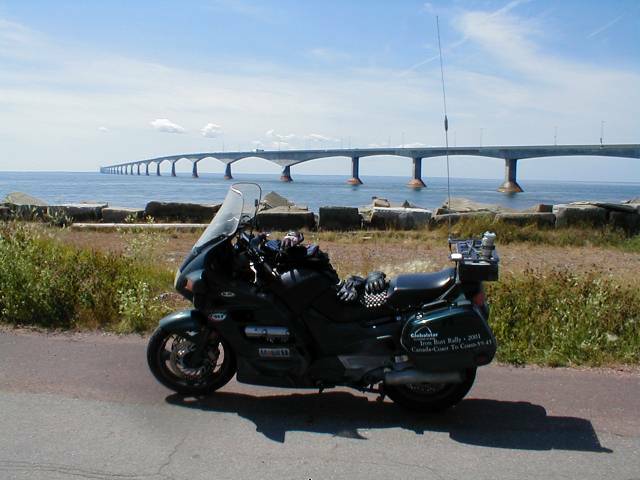 Here is a photo from my ride to Prince Edward Island. My first attempt at riding there on this trip was canceled due to severe rain. I was also in the beautiful city of Halifax, Nova Scotia. Overall a wonderful trip.